Need to find a home for your bunny? Los Angeles Rabbit Foundation is a 501(c)(3) charitable organization that is run by unpaid volunteers. Your donations will directly pay for operations, food, supplies for shelter and foster rabbits. You can also send a check to “Los Angeles Rabbit Foundation,” P.O. Box 252124, Los Angeles, CA 90025. Please use our legal name and our FEIN number, 20-4666808, when making any charitable contributions to our organization. Thank you! If you have a matching grant program with your employer, then you have the opportunity to help the rabbits even more. Please sign up for the Ralphs Club Community Contribution program and help the rabbits. It’s FREE for you and it means a lot to us! Ralph’s requires you to renew your contribution assignment annually. After you confirm your online account by clicking on the link in your email, return to www.ralphs.com and click on ‘my account’ (you may have to sign in again first). 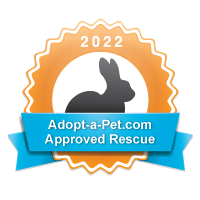 Remember to click on the circle to the left of your organizations’ name, Los Angeles Rabbit Foundation. Our number is KL679. Remember to swipe your card every time you shop at Ralph’s, and you’ll help us raise money for the bunnies! THANK YOU FOR HELPING US SAVE LIVES!